For more information or to refer a patient to any of our physicians, please call 718-920-7707. The Department of Neurological Surgery at Montefiore Medical Center, the University Hospital for Albert Einstein College of Medicine, has a long and distinguished history of providing innovative tertiary and quaternary care to patients with nervous system disorders. In the past year, we have continued to enhance our offerings as we pursue even greater partnerships across the institution to ensure a collaborative approach to care and optimize patient outcomes by combining our full expertise in surgery, interventional radiology and oncology. As part of our effort to make these outstanding services more available and convenient to patients, the Department of Neurological Surgery is now offering neurosurgical consultations in Scarsdale, New York, in the heart of Westchester County. 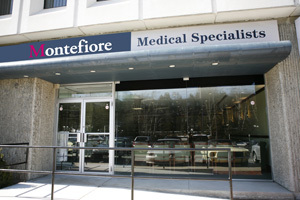 Housed at the Montefiore Medical Specialists building, our new medical office offers ample parking and convenient access to our expert neurosurgeons. In collaboration with our neuroradiology specialists, we continue to employ the latest techniques in interventional neuroradiology, including intra-arterial embolization, angioplasty and stenting. Most notably, we have expanded our capabilities with the recruitment of a neurosurgeon specially trained in endovascular neurosurgery who can perform interventional neuroradiologic procedures as well as microsurgical methods. Our neurosurgeons have treated more than 7,000 patients, including children with birth anomalies, craniofacial tumors and post-traumatic deformities. We enjoy an international reputation for devising protocols for complicated procedures, including the first totally successful separation of twins conjoined at the head. Our collaborative efforts with our Plastic and Reconstructive Surgery colleagues broaden the therapeutic options that can be considered to treat children with these conditions. In collaboration with Montefiore Einstein Center for Cancer Care we offer state-of-the-art surgical and diagnostic techniques for brain and spinal cancers. Our neurosurgeons are skilled in the latest surgical techniques, including advanced microsurgical methods, frameless stereotactic guidance, ultrasound, and endoscopic visualization and radiosurgery. They work closely with neuro-oncologists and radiation oncologists to determine the best course of treatment for each patient. Patients have access to advanced diagnostics, including CT, MR imaging and spectroscopy, positron emission tomography (PET), and single photon emission computed tomography (SPECT) scanning. We offer advanced techniques in spine surgery, including minimally invasive approaches and stabilization techniques to address complex and degenerative diseases. Our teams incorporate orthopaedic specialists to ensure a comprehensive treatment approach. Our spinal oncology offerings, organized in collaboration with Montefiore Einstein Center for Cancer Care, include treatments for complex degenerative, traumatic and neoplastic spine diseases, including intrinsic intradural, intramedullary and extradural metastatic spine tumors. In coordination with the Montefiore Einstein Comprehensive Epilepsy Center, we offer sophisticated services focused on helping patients with intractable epilepsy. With a staff including some of the leading physicians in the world, we provide pioneering therapeutics, such as resective surgery for long-term relief from seizures, for both children and adults. Through a commitment to advanced technology, superior clinical excellence and exceptional medical education, The Children’s Hospital at Montefiore is known for unrivaled expertise in caring for children with neurosurgical illnesses. Areas of emphasis include craniofacial reconstruction for congenital abnormalities as well as brain and spinal cord tumors.